Antioxidant enzymes, such as superoxide dismutase (SOD) and ascorbate peroxidase (APX), play important role in ROS homeostasis in plants. In the present study, two important antioxidant enzyme-encoding genes, cytosolic Cu/Zn-SOD and APX, were isolated from Potentilla atrosanguinea and Rheum australe plants, which grow at high-altitude regions of Himalaya. Previously, we have reported cytosolic overexpression of both the genes in Arabidopsis, individually and in combination and these transgenic plants exhibit cold and salt stress tolerance. In the present study, wild-type (WT) and transgenic lines (cytosolic Cu/Zn-SOD and APX) were analysed for their regeneration potential and expression profiling of various genes involved in in vitro regeneration was carried out. Among all transgenic lines, dual transgenics showed early callus induction and shoot regeneration. 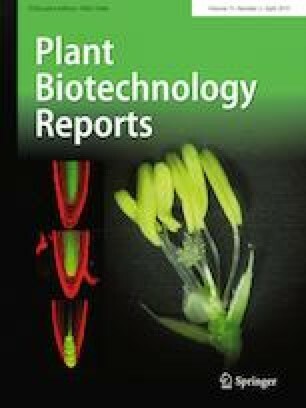 Callus growth rate and in vitro regeneration capacity were significantly higher in transgenic lines compared with control plants. Interestingly, H2O2 accumulation and SOD activity were found to be higher in SOD and dual transgenic lines during callus induction and shoot regeneration stages, indicating a correlation between H2O2 and SOD activity with regeneration process. Whereas APX activity in transgenic lines was found to be decreased in regenerated shoots, cotyledons, it was increased in callus and roots. Further, expression analysis of several genes involved in callus induction and in vitro regeneration using qRT-PCR showed that the majority of genes were significantly up-regulated (two- to fourfold) during different stages of regeneration in transgenic lines. Consequently, our results substantiate that a minimal amount of H2O2 accumulation brought about by overexpression of SOD and APX genes may play an important role in early callus induction and shoot regeneration in transgenic line. The overall results will add knowledge about the role of antioxidant genes in in vitro regeneration of plants. The online version of this article ( https://doi.org/10.1007/s11816-019-00535-2) contains supplementary material, which is available to authorized users. This work was supported by Grants from the Council of Scientific and Industrial Research (CSIR), New Delhi, India, under CSIR Network Projects: SIMPLE (BSC0109) and Pla-Gen (BSC0107) and Indo-German Science and Technology Centre (IGSTC), India. A.S. and T.G. acknowledge fellowships awarded by the CSIR, India. PSA, SK and AKS designed research; AS and TG performed research; IZ did the statistical analysis; AS, IZ and AKS analysed data; AS, IZ, and AKS participated in writing the whole manuscript. The authors declare that they have no conflict of interest. This work was supported by Ministry of Science, ICT and Future Planning (Grant no. NRF-2017R1A2B4012820).